This quaint cupcake shop recently moved into the St. Charles Town Center Mall and is adorable. Decorated in blue and brown (as is their website), with very friendly staff, it is a diamond in a mall full of brand name stores and chain restaurants. The cupcakes are displayed in large cake pedestals with covers. The flavors change regularly and there are always specials going on. Prices are fair at $2.75 per cupcake with a dozen costing an even $30. Being the “Red Velvet Girl” I had to take one of these home! The cake was a little dry, but a lot of red velvet tends to be, so I wasn’t shocked. The icing was supposed to be cream cheese icing, but tasted much more like sweet vanilla icing – with a dash of cream cheese. Over all, it ended up being a very sweet cupcake, but not a very great red velvet. 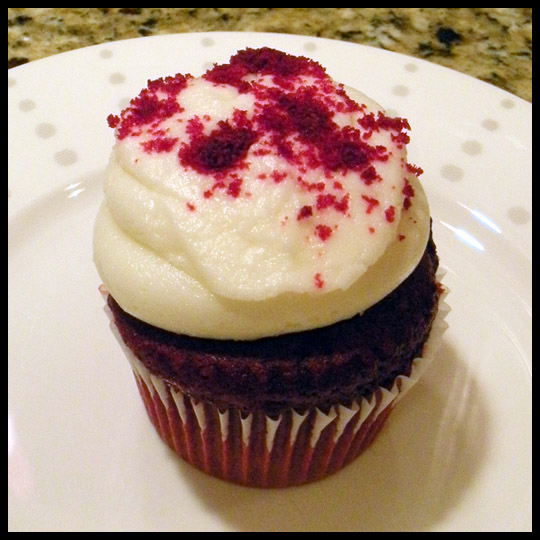 One of the reasons I love a good red velvet cupcake is because they aren’t too sweet, and this one fell short of that. This beautiful cupcake had a lovely orange/yellow color with cinnamon swirling through the icing. The cake wasn’t the most moist, but with the icing, created a perfect autumn taste, texture, and feel. My mom – who is not a huge sweets eater – said, “It’s really good” and ate more than one bite, which is saying a lot for a little cupcake. I agreed with her and would definitely order this cupcake again! 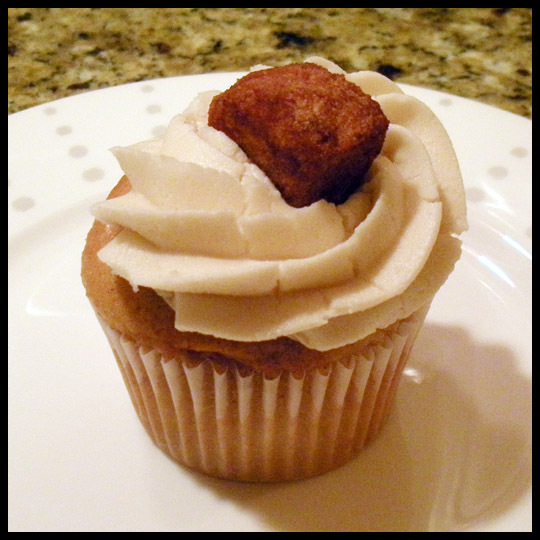 Topped with a piece of a breakfast french toast stick, this cupcake really looked and tasted like breakfast! 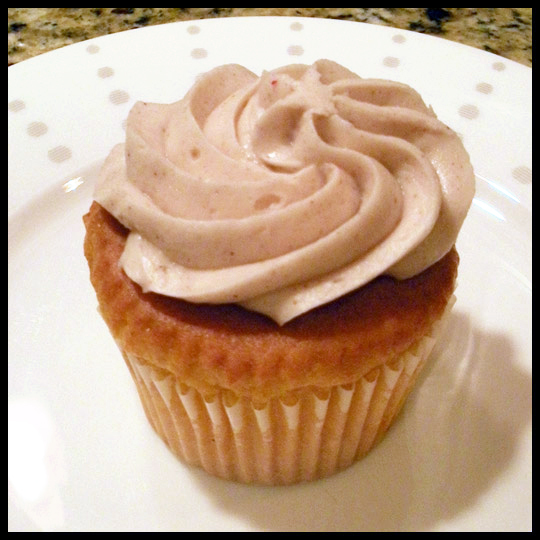 With a sweet butter cream icing that had just the right touch of maple. The cake was spicy and savory! I love french toast cupcakes, and while I think they are all better with bacon on top (because everything is better with bacon), this one is one french toast cupcake that can stand without it! This cupcake was the standout of the for for me. While I am not a huge chocolate cake fan, this cake was dense, but moist and very flavorful! 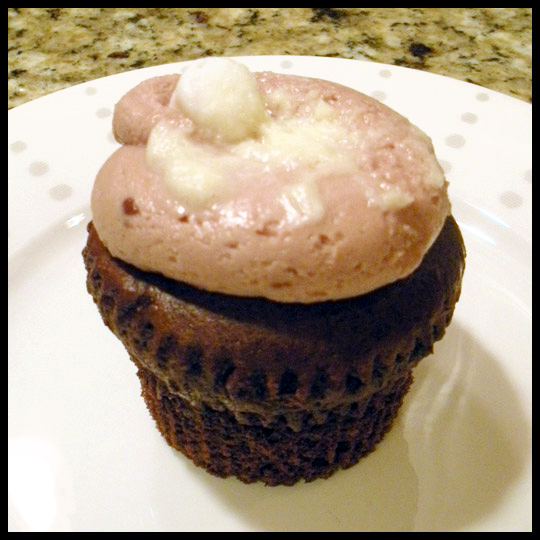 The “hot chocolate” butter cream icing was very creamy and smooth – NOT gritty the way that some icings with hot chocolate mixed in can be. Together they created one yummy cupcake that would like to eat again! This entry was posted in Cupcakes, Maryland and tagged Cupcake, cupcake pavilion, french toast, hot chocolate, pumpkin cupcake, Red Velvet, southern maryland, waldorf by Crusader Elisa. Bookmark the permalink. Elisa I appreciate your comment’s, here at Cupcake Pavilion we try our best to please each and every customer. With that said where still a work in progress and only strive for the best, while we may not please eveyrone we sure do aim to please. Thank you for the article and most of all for given Cupcake Pavilion a chance. Hope to see you soon!